Stockport Relay for Life Cheadle – in aid of Cancer Research UK is supported annually by local letting agent in Cheadle, Stuarts Property Services Ltd. 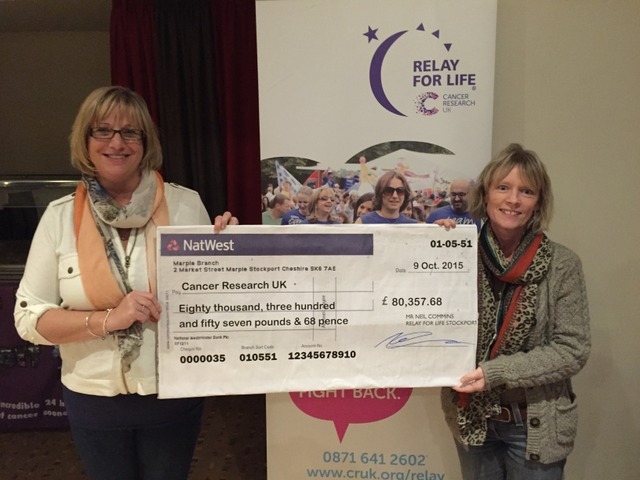 The directors of Stuarts Property Service Ltd are dedicated fundraisers to Cancer Research UK and support the “Stockport Relay For Life” campaign proudly raising £7029.23 towards the £80,357.68 raised in 2015. 4th February 2016 marks the nationally recognised Cancer Awareness Day. Relay For Life brings people together to help beat cancer sooner. Throughout the year, teams of 8 to 15 people get together and fund raise in their local communities to support the work of Cancer Research UK. Then everyone comes together in an inspiring overnight celebration and commemoration that the whole community can be part of. On the day of Relay For Life Stockport you can expect a celebratory mix of music, games, entertainment, food, fundraising and perhaps a few surprises! Whilst the event is in full swing, members of each team will take turns to walk around the track for the duration of the Relay. All events are overnight, to highlight the fact that cancer never sleeps. Join us for Relay For Life Stockport and be part of something special. You can take part by starting a team and becoming the Team Captain, joining a team as aTeam Member or by taking part as a Survivor. Relay For Life Stockport will begin with the inspiring Survivors’ Lap of Honour. Cancer survivors will walk the first lap of the course, cheered and supported by the community. Together we celebrate life and the efforts we are all making to help beat cancer sooner. At the end of Relay For Life Stockport, everyone joins together for a final lap to celebrate their fundraising achievements and look back on an unforgettable experience. Our team “Close Encounters of The Relay Kind” proudly has at least three survivors on it which shows that each and every donation counts. All money raised will support Cancer Research UK’s life-saving research into preventing, controlling and curing all cancers.